TUESDAY, Dec. 9, 2008 (Health.com) — Men who want to reduce their prostate cancer risk shouldn't bother popping antioxidant vitamins and supplements, according to two of the largest trials ever conducted on vitamins and cancer prevention. The studies published this week in the Journal of the American Medical Association show that vitamin C, vitamin E, and selenium won't ward off prostate cancer—or other types of the disease—in men. In one study, 35,533 cancer-free men in their 50s or older took selenium and vitamin E alone or in combination. Several years later, they had the same risk of developing the disease as men who took a placebo. In a second study of 14,641 men—some of whom may have had early-stage prostate cancer—a combination of vitamin E and vitamin C didn’t prevent prostate cancer, or any other type of cancer. “It looks like these particular antioxidants are not effective,” says Howard Soule, PhD, chief scientific officer of the Prostate Cancer Foundation in Santa Monica, Calif., who was not involved in either study. According to the American Cancer Society, 1 in 6 men will get prostate cancer in his lifetime, and 1 in 35 will die of the disease. The ACS estimates that 28,660 U.S. men will die of prostate cancer in 2008, accounting for roughly 10% of all cancer-related deaths in men. Vitamins seemed promising in the 1990s, after one study found that men who took selenium supplements had a 65% lower risk of prostate cancer, and another found that vitamin E cut risk by 35%. But those findings were from trials that had not been specifically designed to look at prostate cancer, or they looked at men in the population who just happened to be taking vitamins for other reasons. So researchers launched the two new studies: the Selenium and Vitamin E Cancer Prevention Trial, aka SELECT, led by Scott M. Lippman, MD, of the University of Texas M.D. Anderson Cancer Center, in Houston, and Eric A. Klein, MD, of the Cleveland Clinic Lerner College of Medicine; and the Physicians’ Health Study II Randomized Controlled Trial (of vitamins C and E), led by J. Michael Gaziano, MD, of Brigham and Women's Hospital and VA Boston Healthcare System. The Physicians’ Health Study followed participants for 10 years, while SELECT—the largest clinical trial ever run of chemoprevention for cancer—was halted early when the researchers found no benefit for the supplements. Durado Brooks, MD, director of prostate cancer for the American Cancer Society, called the findings “disappointing,” noting that for many years men have been taking the vitamins in the hopes that they would be preventive. 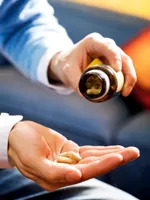 Although some experts might argue that supplements could be effective in different doses or combinations than those used in the study, "it’s doubtful that the results would be any different," says SELECT study author Dr. Klein. Next: Should you stop taking supplements? Neither study showed harm from taking the supplements, notes Dr. Gaziano, who participated in both studies. But this doesn’t mean people should keep doing so, he warns. And what are those beneficial things? Dr. Klein notes that in the Prostate Cancer Prevention Trial, the drug finasteride reduced a man’s chances of developing prostate cancer by 25%. The drug tested in that trial is the same medication in the anti-baldness drug Propecia, but at a higher dose. Dr. Klein suggests that men concerned about their prostate cancer risk talk to their doctor about taking finasteride. There is also some evidence—though no firm proof—that exercising, quitting smoking, maintaining a healthy weight, and eating less fat could help prevent prostate cancer or slow the progression of the disease. Following a Mediterranean-style diet, which includes plenty of fruits and vegetables, healthy oils from fish and nuts, and moderate amounts of alcohol, may also be beneficial, Dr. Gaziano says. Even pomegranate juice and broccoli may help, and they can’t hurt, advises Soule: “A lot of things that appear to have a scientific rationale for chemoprevention may also make you healthy."